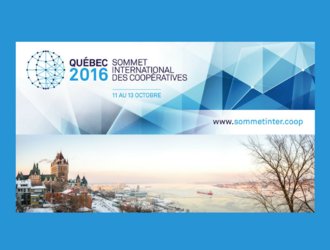 Following the great success of the 2012 and 2014 Summits, Desjardins and the International Co-operative Alliance have announced that a third edition of the International Summit of Co-operatives will be held from October 11 to 13, 2016, in Quebec City, Canada. “The Efficiency of the Co-operative Banking Model”. - For more sessions and speakers from financial co-operatives, please read more HERE. - Studies on financial co-operatives: Banking Business Models Monitor - Europe 2015 (IRCCF, HEC Montreal), Impact of financial regulation on risk policy of financial cooperatives (IAE, Paris), A Snapshot of European and Canadian Co-operative Banking (Tias, Tilburg University). For the full list, please click HERE. Third International Summmit of Co-operatives Announcement | 11-13th October 2016 from EACB on Vimeo. The Press Release announcing the Third International Summit of Co-operatives in 2016 can be found HERE. About the International Summit of Co-operatives : The International Summit of Co-operatives is the world’s leading event for business development in the co-operative and mutual community. It offers managers, decision-makers, and leaders of co-operative and mutual enterprises a unique forum for reflection, discussion, cooperation, and training on major trends and their current and future issues, supported and enhanced by the attendance of internationally recognized experts. By demonstrating that co-operatives are one answer to the major economic issues of our times, the Summit aims to promote and foster the development of co-operative enterprises in all countries.